The Lego Back to the Future DeLorean (21103) set is here. The official release date has been set for August 1st, but if you happen to be at the San Diego Comic-Con (SDCC) you can purchase it early at the Lego booth. (UPDATE: it is now available on Amazon ). Amazingly with a 401 piece count the $34.99 price tag is actually reasonable (the old 10¢ a piece ratio). Being part of the Lego CUUSOO project, this DeLorean features some advanced building techniques and lots of SNOT. Sharing more in common with a MOC then an official Lego set. 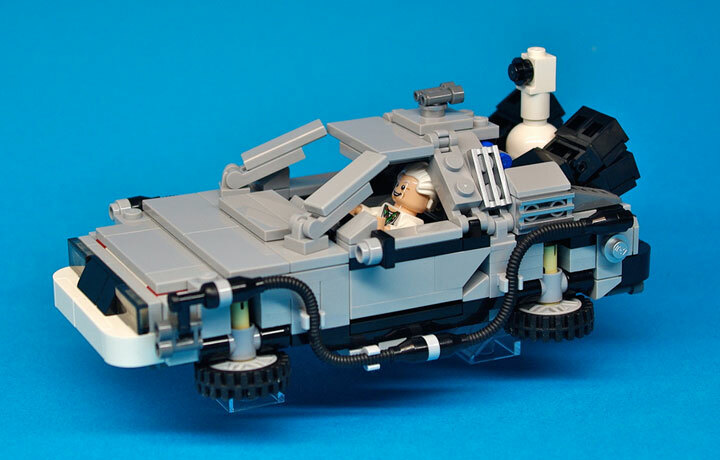 The neat thing with this Lego DeLorean is that it can be transformed into the iconic time machine from all three movies. The perfect bound instruction manual offers full instructions on how to put them together. 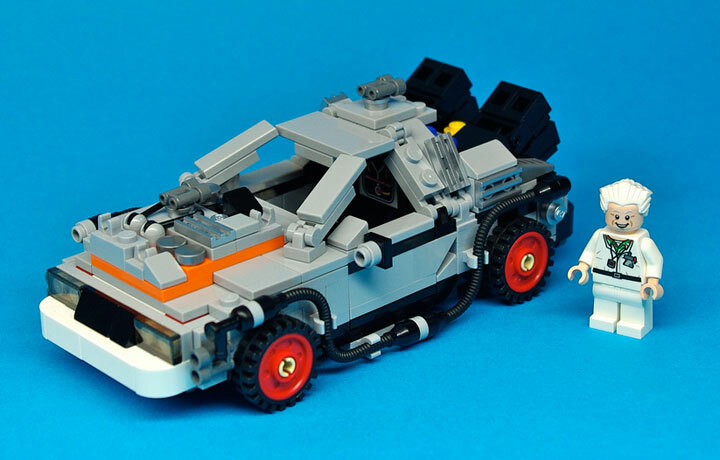 The Lego Back to the Future 2 (BTFF2) DeLorean adds a Mr. Fusion, new 2015 license plates, and floating tires. While Lego The Back to the Future 3 (BTFF3) DeLorean adds new red tires, and a new engine. The controversial decision to have a tile based hood was made so that the BTFF3 DeLorean could have this interchangeable engine. The good news is that this hood design doesn’t look as terrible as it does on the box art. 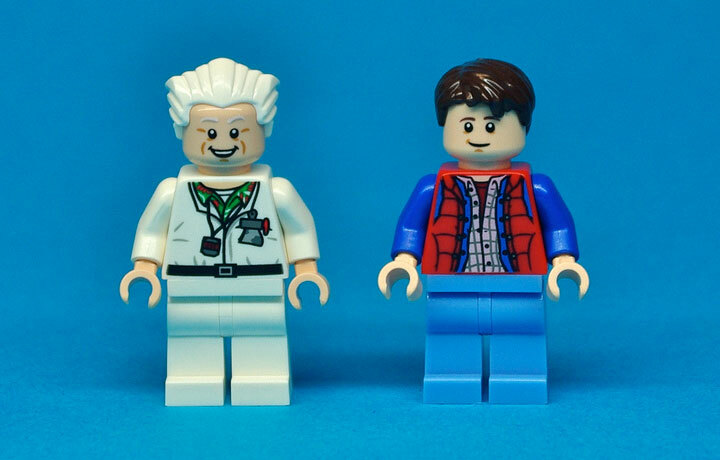 The two included minifigures are Marty McFly and Doctor Emmet Brown. Getting these exclusive minifigs is a huge bonus. The torso prints are well done. Lego could have included multiple minifigure bodies to represent each figure in all three time periods, but they didn’t. Combining these figures with the recent The Lone Ranger theme, you could probably come close to some BTFF3 minifigures. No such luck with BTTF2. But, maybe some day in the future we can get a Doc Brown minifigure with an awesome yellow coat! Lego Back To The Future DeLorean (21103) – Get It Before You’re OUTATIME. 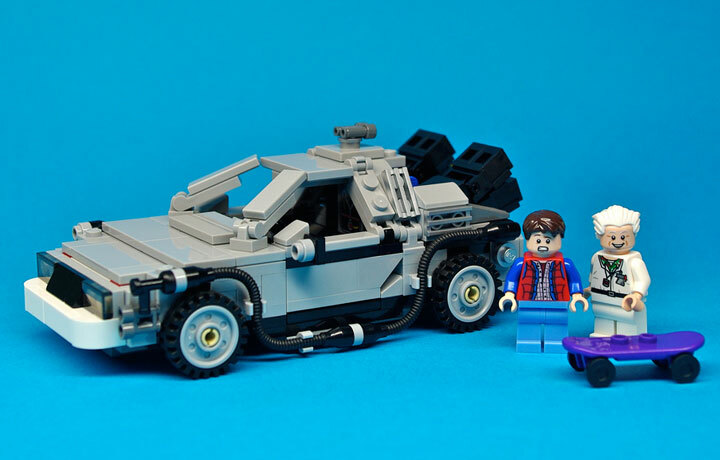 Lego Back To The Future: DeLorean Time Machine — Minifigure Details!